Well, I thought readers might enjoy a little levity about Thanksgiving. 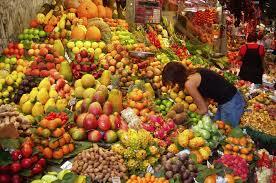 I realize that not everyone overeats or even goes shopping on Thanksgiving, which is once more upon us. Gathering with friends and family is a great tradition, and we can even find a way to enjoy meals without meltdowns over politics, religion or lifestyles. Please take note of the Brass Bash at the Amsterdam on Sunday. There will be lots of good music, and the proceeds go to KFAI. Would love to see you there. In the meantime, have a good holiday, and if you get stressed out, take some time to let music lift your spirits. There is certainly plenty of it around. Davu Seru Trio @ Jazz Central, Minneapolis. 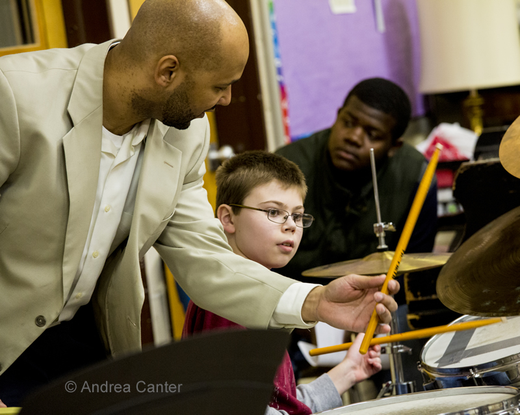 8:30pm (donation) Davu Seru, percussion, Josh Granowski, bass; and Park Evans, guitar. Seru is a drummer/percussionist who is equally at home playing straight ahead jazz, free jazz, and desert blues, among others. Park Evans and Josh Granowski are equally versatile. Phil Hey Quartet @ The Artists’ Quarter, Saint Paul. 9pm ($5) A long-running quartet that doesn’t seem to appear outside of monthly AQ performances, Phil Hey, drums; Dave Hagedorn, vibes; Tom Lewis, bass; and Phil Aaron, piano. Expect a very high level of performance of tunes by Coletrane, Coleman, Mingus, and more. Here they are a few years ago, doing a standard. Talking Strings @ The Black Dog Coffee & Wine Bar, Saint Paul. 8pm (Tip jar) Pavel Jany, guitar; Gary Schulte, violin; and Andrew Foreman, bass; playing global jazz – French jazz, bossa novas, gypsy jazz, and more. Atlantis Quartet @ The Icehouse, Minneapolis. 11pm ($8) Some late night modern jazz. The Atlantis Quartet has built a strong following in the Twin Cities based on the stellar playing of Zacc Harris, guitar; Chris Bates, bass; Brandon Wozniak, tenor sax; and Pete Hennig, drums. Pat Mallinger & the Bill Carrothers Trio @ The Artists’ Quarter, Saint Paul. 9pm ($15) Mallinger (sax) and Carrothers (piano) are Saint Paul talents who have made good and now live in Chicago and Upper Michigan, respectively. When they’re in town, they head to the AQ, where their combined talent makes for a very special show. Here’s Pat hard at work. George Maurer Group @ The Dakota, Minneapolis. 8pm ($12) Maurer may be the most talented Minnesota musician you haven’t heard about, since he resides in Saint Cloud and only sporadically performs in the Twin Cities. 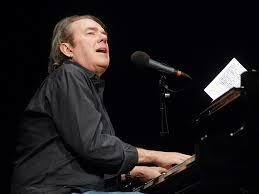 He’s a pianist/composer/producer who has collaborated with musicians ranging from Prudence Johnson to Eric Clapton. Tonight he brings a septet, including two horns, to the Dakota. Check out their take on a Beatles tune. Maryann Sullivan & Dave Martin@ Mendoberri Cafe & Wine Bar, Mendota. 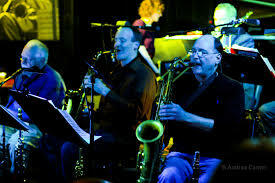 7:30pm – 10:30pm (No Cover) Here’s a low-key way to eat out at a casual restaurant and hear some fine jazz. Vocalist Sullivan and guitarist Martin will be swinging some standards and a holiday tune or two. KFAI’s Brass Bash @ The Amsterdam Bar & Hall, Saint Paul. 6pm ($10 Suggested Donation) This is a benefit I’ve put together for KFAI, featuring three bands with brass instruments. First up at 6:30 is The Jana Nyberg Group. Jana swings and sings with taste, and with the help of husband/trumpeter Adam Meckler, brings new life to bossa novas, jazz chestnuts, and contemporary pop. At 7:30pm it’s Parham, Schimke, Anderson, Boettcher, and Washington. This quintet represents some of the best of Twin Cities Jazz. Solomon Parham, trumpet; Peter Schimke, piano; Kevin Washington, drums; Jeremy Boettcher, bass; and up and coming new guy in town, Tyler Anderson on tenor sax. Suffice to say, the place will be swinging. Then, to close things up at 8:30 or so, we have the Jack Brass Band, whose infectious music encompasses traditional brass band tunes, jazz standards like Night in Tunisia and songs by Marvin Gaye, The Temptations, Bobby Brown and more. They’ve been together for a dozen years or so and have enough street cred to be featured in New Orleans’ Offbeat Magazine, march in a Mardis Gras Parade, and play for WWOZ. Here’s the Jana Nyberg Group in the KFAI studios. Joey DeFrancesco Trio @ The Dakota, Minneapolis. 7pm ($30) Today’s Hammond organ giant was playing with Miles Davis as a teenager, and also played with John McLaughlin. Last seen here at the MN Zoo with Dave Sanborn, DeFrancesco will put on a smokin’ show of soul-jazz. Check out his take on a song that’s heavily identified with Sinatra. Dean Magraw and Davu Seru @ The Black Dog Coffee & Wine Bar, Saint Paul. 8pm (tip jar) This monthly gig is always impressive, as Magraw on electric guitar, and Seru on drums and percussion use their vast knowledge of jazz, rock, and world musics to create enlightening and inspiring music. Nikki & the Rue-Mates on KFAI and @ The 331 Club, Minneapolis. 5-ish (90.3 & 106.7FM), 7pm (331 Club – tip jar) I’ve been a fan of Nikki’s crystaline voice for years. She’s turned into a fine writer and guitar player as well, ably assisted by Rich Rue on resonator guitar and Jon Larsen on bass. With any luck, she’ll have a drummer along to add some kick to the proceedings. 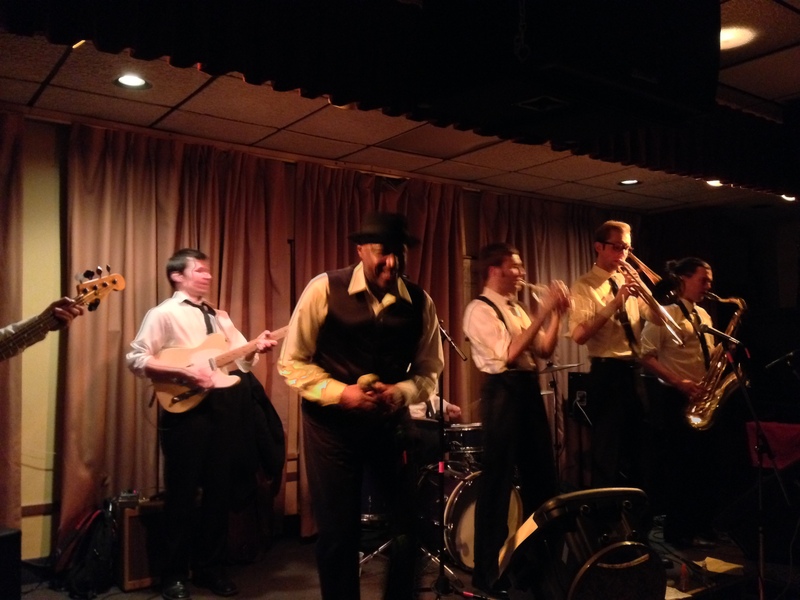 Sonny Knight & Lakers and The Rich Lewis Band @ The Eagles Club #34, Minneapolis. 9pm. ($5) Knight started out in the 60s when he was a teenager, and eventually sang with the legendary Twin Cities band Haze in the 70s. His appearance on the Secret Stash compilation of Twin Cities Soul & Funk has re-energized him and he’s put together a seven-piece horn and organ band to provide some funky backing. They’ve been doing a residency at the Eagles Club for the last month, creating good vibes and building an audience. Tonight’s bash features the Rich Lewis Band, purveyors of funky good times in their own right, albeit with a New Orleans bent to the music. The bash is in the big room, with plenty of space for dancers. Davina & the Vagabonds @ The Dakota, Minneapolis. 7pm ($15) Not a lot to do on Thanksgiving night, but if you want something that will appeal across generations, you can’t go wrong with the highly unique, energetic blues, R&B, and jazz of Ms Davina and the highly polished Vagabonds. Doug Otto & the Getaways @ Ray J’s Northeast, 500 Central Ave, Minneapolis. 9:30pm Doug’s mournful voice is perfect for the old timey roots music that he prefers. The Getaways include Josh Granowski, Alberto Castro Perez, Jr., and Chris Gray. TAKK @ Juxtaposition Arts’ Moja Gallery, 1108 Broadway, Minneapolis. 7pm, performances at 8pm & 9pm (Free) TAKK is a dance project with video installation that looks at relationships through the lens of sports. There promises to be much interactivity during the dance performances. Dee Miller Band @ Shaw’s, Minneapolis. 9pm (Tip Jar) The Duchess of the Blues, helping you to dance off the Thanksgiving meal pounds. The Butanes and the Marbles Acoustic Band @ Harriet Brewing Tap Room, Minneapolis. 7pm ($5 after 8pm) The Marbles Acoustic Band, an octet, start things off with their jam-ish versions of 60s and 70s folk-rock. Then The Butanes come on at 9 to take you down blues alley. 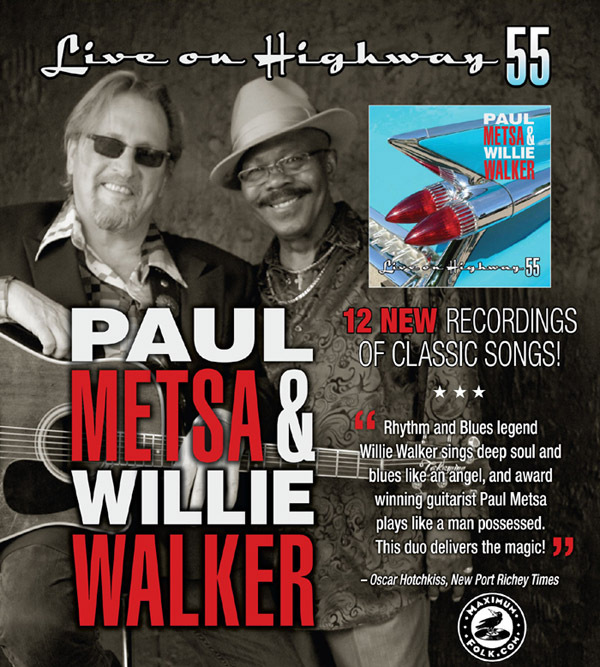 Paul Metsa & Willie Walker CD Release Party @ Famous Dave’s, Minneapolis. 5pm – 7pm. 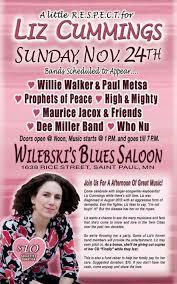 (No Cover) The other great singer/songwriter to come out of the Iron Range has been playing with soulman Willie Walker for a few years now. The combination of Paul’s sterling guitar playing and Willie’s angelic, yet soulful voice makes for good chemistry and great music. The CD is called Live from Highway 55. Black Market Brass, Brass Messengers, and Body Omara @ The Nomad, Minneapolis. 9pm ($5) Looking for some Afrobeat, world brass, and desert blues? You will want to be at the Nomad tonight. Big George Jackson @ The Schooner, Minneapolis. 9pm (No Cover) Big George has a seemingly bottomless voice that is equal parts scary and comforting. 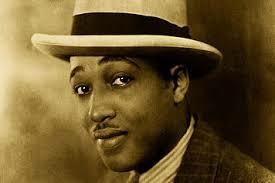 Just right for the Delta-inspired blues that he sings. He has a crack band behind him as well. Here he is. The lights will soon be on in Saint Paul’s downtown parks. 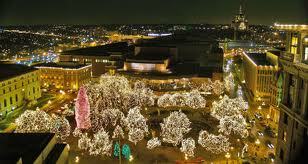 The lights may be going up in Saint Paul’s Rice Park, but the days are dwindling down for the Artists’ Quarter. And so, jazz fans will have limited opportunities to see some of their favorites in the place, at least while it’s under the ownership of Kenny Horst, who should be feted for the time and effort he’s put into making the club such a special place. Things are moving nicely in Blues and Roots music, though there seems to be an emphasis on roots this week, at least from my perspective, with a couple of events that surely qualify as “Other.” All in all, this week there are many great opportunities for you to hear live music. Miguel Hurtado & Friends @ The Artists’ Quarter, Saint Paul. 9pm ($5) Hurtado’s friends often include Brian Courage, bass; Jake Baldwin, trumpet; and Joe Strachan, on piano, who he’s been hangin’ with of late, but who really knows? Doesn’t matter, it will be an evening of invigorating jazz. Maud Hixson and Robert Bell @ Barbette, Minneapolis. 10pm. (No cover) After singing with the Wolverines Trio earlier in the evening at Hell’s Kitchen, Ms Hixson will be making her way to Barbette to sing with guitarist Bell. The late night happy-hour vibe is just right for Hixson’s smoldering, yet cool takes on standards, old and new. Phil Mattson Singers @ Jazz Central, Minneapolis. 8pm ($10) Vocal jazz from a sextet directed by Grammy nominatied pianist Phil Mattson, who has done arrangements for the Manhattan Transfer, the Four Freshmen, and other notable singing groups. Pete Whitman’s X-Tet @ The Artists’ Quarter, Saint Paul. 9pm ($8) I believe this is the last appearance of the X-Tet before the closing of the AQ on December 31. To paraphrase the title of an old Count Basie album, it’s Ten Men Swinging, which flows better than the reality of eight men and two women swinging. The two women are Laura Caviani, piano; and Kathy Jensen, baritone sax. Vicky Mountain @ Parma 8200, Bloomington. 7:30 – 10pm. With Chris Lomheim, piano, Brian Courage, bass. Intimate songs in an intimate setting. Vicky is an experienced singer who knows her way around a scatted melody, and isn’t afraid to include some non-standards in her repertoire. Lulu’s Playground @ The Artists’ Quarter, Saint Paul. 9pm ($12) As we head towards the end of the year, artists will have their last chance to play the AQ. 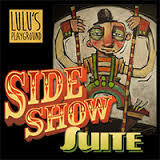 Lulu’s Playground, the accordion – cello -guitar – trumpet group is going out with a CD Release Party for The Side Show Suite, a collection of 17 short pieces based on 17 Side Show Characters created by artist Tim Nyberg. Part of the show will include the kind of verbal come-ons you hear from a carnival barker. It’s Chamber Jazz with an healthy dose of humor. Linda Peterson @ School II Bistro, Chanhassen. 5:30 – 8pm ($?) Since the passing of her mom, the Matriarch of the musical Peterson clan, Linda has been living in the Twin Cities. This evening, West Metro residents have a chance to hear Linda sing and play piano. I’m sure she’ll sing her well known composition, “It’s Too Late to Leave Early,” as well as other originals and standards. Adam Meckler Orchestra @ The Artists’ Quarter, Saint Paul. 9pm ($10) Meckler keeps churning out new music for this aggregation. The AQ is a fine setting for this 17 piece band. Here they are playing in Rice Park last summer. Jon Rodine on KFAI and @ The 331 Club, Minneapolis. 5pm (KFAI, 90.3 & 106.7FM) and 7pm (331 Club – Tip Jar) Rodine sings Americana music, though his definition of Americana embraces a big tent with rock n’ roll, country soul, and a bit of funky grooves. His latest album with just original music is getting some nice print. Amy Helm @ The Real-Phonic Hour, Central Library, 4th & Market, Saint Paul. 7pm ($20) With Martha Scanlan, Erik Koskinen & the Real-Phonic Band, comedian Thom Middlebrook. Singer Helm was last seen here with her dad, the late Levon Helm. She impressed mightily at the time, and was a real asset to the show. Martha Scanlan will open, and the Real -Phonic band will entertain, as usual. Papa John Kostad’s Acoustic Blues @ Merlin’s Rest, Minneapolis. 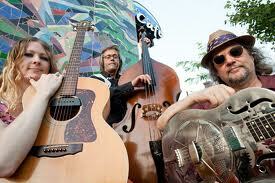 8pm – 11pm (Tip Jar) Papa John will be joined Cal Hand on dobro, and by Judy Larson for a song or two. These Acoustic Blues Nights are a chance for Papa John to concentrate on the blues, and on his twelve-string. Be sure to bring an ID if you want adult beverages, which include a wide variety of British beer and some of Scotland’s finest distilled spirits. 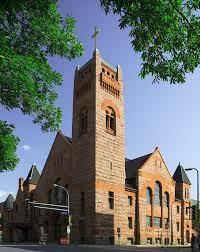 Sangam @ Sundlin Hall, 1536 Hewitt Ave, Saint Paul. 6:30pm – 9:30pm ($25/$20 Students) A musical journey, if you will through both Eastern and Western musical milieus. The evening will begin with performance of both the Indian Carnatic and Western Classical music and conclude with a collaboration among performers, who include Davu Seru, percussion; along with Nirmala Rajasekar, veena; Shri Thanjavur K. Murugabhoopathi, mridangam; and Michelle Kinney, on cello. American Roots Revue @ The Dakota, Minneapolis. 7pm, 9pm ($30) Four long time musicians combine their considerable talents to explore a wide variety of American music: Folk, Cajun, Gospel, R&B, Rock, Swing and Country. Robert Robinson’s voice can shake a room. Larry Long’s gifted storytelling will bring you into his songs. Tonia Hughes and JD Steele complete the quartet, which will be backed by a first class set of musicians: Cory Wong, guitar; Brian Ziemniak, keys; Johannes Tona, bass; and Michael Bland, drums. CJ Chenier @ The Dakota, Minneapolis. 7pm ($25), 9pm ($20) Hey la bas. The Dakota may be a bit classy for the insistent, soul shakin’ undulatin’ sounds of zydeco, but leave it to CJ to break down a Minnesotan’s reserve, just as his father did back in the day. Here’s an example of his live show. Caprice Saxophone Quartet @ Studio Z, Saint Paul. 7pm (Free) Now for something completely different. Well, different in that this quartet will be playing new classical music, an inadequate term, from Minnesota composers Katherine Bergman, Justin E.A. Busch, Ian Cook, and Justin Rubin. The group is composed of sax players Sarah Minette, soprano; Ross Wolf, alto; Katherine Bergman, tenor; and Jessica Martin, baritone. Tribute to Sue McLean @ First Avenue, Minneapolis. 7pm ($50) Well, this is a gathering of friends of the much loved late concert promoter Sue McLean, as a way to raise funds for her daughter Lily. It’s an all-star gathering, including Patty & Ricky Peterson with Paul Metsa and band. Metsa will be performing his song Jack Ruby. Others appearing include Eric Hutchinson, Soul Asylum, The BoDeans, the X-Boys, Marc Perlman & Tim O’Reagan of the Jayhawks, The Witnesses, Rogue Valley, Molly Maher and Haley Bonar. Phew! Armadillo Jump @ Manitou Station, White Bear Lake. 9pm (No Cover) The tiny dance floor at Manitou Station is sure to be filled as Armadillo Jump brings their unique combination of blues and jump tunes to the East Metro hot spot. Daisy Dillman @ Famous Dave’s, Minneapolis. 9pm ($10) Childhood friends who combined four-part country harmonies with a rock drummer and electric fiddle back in 1978, the Dillmans won a couple of Minnesota Music Awards, garnered national airplay, and then toured the country through the early 80s. They’ve played sporadically since reuniting in 2003. They’ll be a sextet tonight, with the addition of Kenny Wilson on pedal steel, banjo, and dobro. Benefit for Liz Cummings @ Wilebski’s, Saint Paul. 1pm ($10 suggested donation) Cummings is a singer/songwriter/pianist who was diagnosed with a particularly aggressive form of dementia in August of 2012, so members of the blues community are coming together to support her. Scheduled to appear: Willie Walker & Paul Metsa; High and Mighty, Prophets of Peace, Maurice Jacox & Friends, Who Nu, and the Dee Miller Band. You would think this is harvest week, what with the abundance of music from visiting and resident artists, including a couple of shows that pay homage to music pioneers (Ellington, Tito Puente, Basie’s vocalists), as well as a couple of pioneers themselves (Blind Boys of Alabama, Allen Toussaint). Various combinations of musicians are combining to bring us new arrangements and new music. All in all, we’re very lucky here in the Twin Cities. Just remember to get out, especially to the Artists’ Quarter, which we may lose around the first of the year. Brandon Wozniak & Friends @ The Artists’ Quarter, Saint Paul. 9pm ($5) Wozniak wields his sax like a painter: soft strokes here; gauzy backgrounds there; and giant splashes of bold color when it suits the composition. He plays in the Atlantis Quartet and the Dave King Trucking Company, among other configurations, so it’s no telling who will show up as his friends for the evening. Patricia Barber @ The Dakota, Minneapolis. 7pm, 9pm ($30) Barber is an adventurous pianist with a smoky, yet cool voice with an understated elegance. 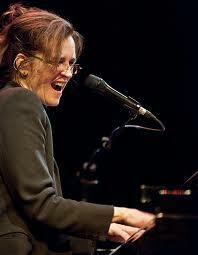 She composes songs that are poems in the best sense of the word, and is the first songwriter to receive a Guggenheim Fellowship. Except for a long-running weekly residency at the Green Mill in Chicago, she seems to play out only just enough to keep folks interested. We’re lucky to have her here, perhaps because she’s got a history with the Dakota that dates back to the nineties. Foreman, Feily, Schmidt, and Musselman @ The Black Dog Coffee and Wine Bar, Saint Paul. 8pm – 9:30pm (tip jar) No, it’s not a law firm but rather four friends who improvise to a variety of genres. Andrew Foreman, bass; Dave Feily, guitar; Zach David, drums; and Dan Musselman, piano. Dave Karr @ The Artsits’ Quarter, Saint Paul. 9pm ($5) Old school bebop, along with lovely ballads from this 80-something master of both the tenor and the baritone sax. Zeitgeist’s New Music Cabaret @ Studio Z, Saint Paul. 6:30pm Thurs, Fri, 7:30pm Sat, 7pm Sun ($10/evening) Four nights of music including a jazz headliner each evening, along with selections from Zeitgeist and others. Thursday, it’s Red Planet, Friday, Zacc Harris, Saturday, it’s Davu Seru’s Mother of Masks, and Sunday it’s the Nathan Hanson Saxophone Choir. Always an invigorating, and wonderfully surprising series. Bryan Nichols Quartet @ the Artists’ Quarter, Saint Paul. ($12) This is part of a two-night stand for composer/pianist Nichols, with tonight dedicated to quartet performances and Saturday to a Quintet. Nichols’s abilities as a jazz composer have been recognized with a residency at the Betty Carter Jazz Ahead program at Kennedy Center, a grant from the American Composers forum and a McKnight Fellowship. 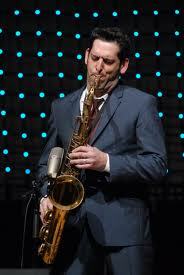 Tonight he’s joined by Brandon Wozniak, sax; James Buckley, bass; & Coy Heally on drums. Here’s the quartet with Mike Lewis on sax. He’ll be joining the group tomorrow night. JazzMN Orchestra Tribute to Tito Puente @ Hopkins High School, Hopkins. 7:30pm ($30, $34, w/$10student rush) The 18-piece orchestra featuring the Twin Cities’ best brings in a couple of extra percussionists as they pay homage to the timbales master who was so adept at integrating big band jazz and latin rhythms. Special guest Lucia Newell will be on hand to sing a couple of numbers as well. Percussionist Ray Rivera was my guest this past Saturday on Rhythm and Grooves. You can listen to the interview and a couple of Tito’s numbers here. Bryan Nichols Quintet @ The Artists’ Quarter, Saint Paul. 9pm ($12) Nichols uses a quintet for the second night of his gig at the AQ, with Michael Lewis joining Brandon Wozniak on saxophones; JT Bates sitting in the drum chair, and James Buckley holding down the bass. Knights in Harlem @ The Capri Theater, Minneapolis. 7pm Saturday, 3pm Sunday ($25) A celebration of the unsung baritones that fronted the Basie band, with the Wolverines Trio (celebrating 40 years) backing Dennis Spears and Stephen Faison. Spears and Faison will be bringing us the songs of Joe Williams, Billy Eckstine, Johnny Hartman, and Arthur Prysock. Connie Evingson: Ellingtonia @ The Jungle Theater, Minneapolis. 4pm & 7:30pm ($25) Connie continues to find interesting themes for her Jazz at the Jungle series. This time the cool singer is tackling the music of Duke Ellington, which should provide excellent material, whether well-known, or obscure. Check with the Jungle on seat availability, as some of these performances sell out. Joining Connie will be: Dave Karr (tenor sax), Doug Haining (alto sax), Preston Haining (trumpet), Tanner Taylor (piano), Gordy Johnson (bass) and Trevor Haining (drums). Roy Hargrove @ The Dakota, Minneapolis. 7pm ($35) Trumpeter Hargrove is a two-time Grammy Winner who is constantly searching, whether playing with Cuban musicians, or strings, recording with jazz icons like Herbie Hancock, or delving into the worlds of hip-hop and neo-soul. In the course of an evening, you can expect him to explore rhythms, original and standard melodies, and moods, all to thrilling effect. Here he is from a few years ago. Moonlight Duo on KFAI and @ The 331 Club, Minneapolis. 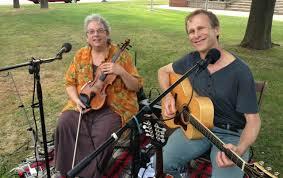 5pm (KFAI – 90.3 & 106.7FM), 7pm (331 Club – Tip Jar) I’ll be hosting this edition of the House Party, with Moonlight duo – Mary Dushane and Nicholas Jordan as my guests. 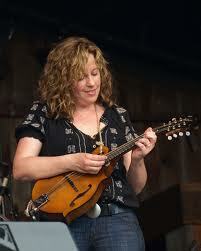 Mary Dushane is a master fiddler, adept at Cajun, Appalachian, Western Swing, and Irish reels, among other genres. Guitarist Nicholas Jordan supplies the knowing vocals. Tune in and then head over to the 331 Club in NE Minneapolis to hear them in person. John Beach, Mary Leinfelder, & Friends @ Dubliner Pub, Saint Paul. 5pm – 7pm (tip jar) Well darn, if I weren’t spinning, I’d be sure to check out John and Mary, a piano player and singer who go together like Jameson & Ginger Ale. Whether you drink cocktails, Guiness, or Grain Belt, you’ll enjoy their music. Blind Boys of Alabama @ The Cedar Cultural Center, Minneapoils. 7:30pm ($30/$35) The Blind Boys continue to expand their audience by recording with a variety of musicians. Their latest CD, I’ll Find A Way, features collaborations with some of today’s brightest pop/rock stars. But it’s the Blind Boys emotional and musical power, grounded in gospel, that sets them apart. Here they are, along with Mavis Staples. Miller, Neale, Schnitzer, Weigand and Sansby @ Holihans Pub, White Bear Lake. 8pm – 11pm (tip jar) Here we have a more-or-less all star band of Twin Cities Musicians. Scottie Miller, piano (Scottie Miller Band, Ruthie Foster); Dan Neale, guitar (Bo Diddley, Martin Zellar, Prairie Home Companion); Bobby Schnitzer, guitar (Lipps, Inc., Taj Mahal, Al Jarreau); Larry Wiegand, bass (Crow, Pacific Gas & Electric, Bobby Vee); and percussionist/drummer Scott Sansby (Willie Murphy, Scottie Miller) gather together to make some big fun music. Luke Warm & the Cool Hands, Jillian Rae Band @ Harriet Brewing Tap Room, Minneapolis. 7pm ($5) Luke Warm is a jug band, but apparently is looking for a juggist, which is either someone who can play a jug, or someone who does bad juggling. At any rate their repertoire ranges from bluegrass and folk to the occasional polka. Jillian Rae, on the other hand, is a complete musician unto herself, though she uses a band. She can sing, fiddle, and write with well-deserved self-assuredness. John Mark Nelson, Simonet & Young, and The Ericksons @ Cedar Cultural Center, Minneapolis. 8pm ($12) It’s an acoustic-y night at the Cedar as up and coming singer-songwriter Nelson (of Minnetonka) is joined by Simonett and Young of Trampled by Turtles, and the talented sister duo, The Ericksons. Worldwide Discoteque @ Club Jaeger, Minneapolis. 9pm ($5) Multi-cultural music encompassing Afrobeat, Sambas, Highlife, Latin, Cumbia, Reggae, Funk, Tropical Boogie, and who knows what else. What is certain is that you won’t be able to stand still as DeeJays Steely Dan, Brian Engel, and friends spin vinyl. Here’s an example of some of the music, along with some images of the dancers. Allen Toussaint @ The Dakota, Minneapolis. 7pm ($45 – $40), 9pm ($40-$35) The gentlemanly architect of New Orleans R&B returns to the Dakota, touring behind his latest CD, Songbook, recorded live in 2009 during his residency at Joe’s Pub in New York, and featuring many of his songs – tunes he does in concert. Eddies @ The Hat Trick Lounge, Saint Paul. 8pm – 11pm ($7) This Saint Paul almost-acapella quintet has become somewhat of an institution at the Trick, filling the music room with fans and harmonies that stretch from sea shanties to the Rolling Stones and Bob Marley. The Gated Community @ The Black Dog Coffee & Wine Bar, Saint Paul. 8pm (Tip Jar) A six-piece band where country meets bluegrass, electric meets acoustic, and Love and Art meet Politics and Science. You are currently browsing the rhythm and grooves blog archives for November, 2013.